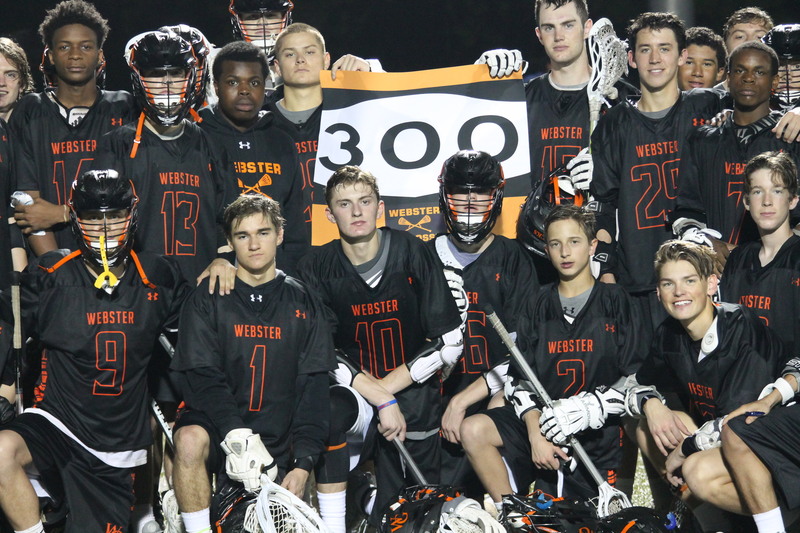 Webster Groves Chucks celebrate with John Binder have he recorded his 300th point in his high school career. John Binder holds multiple hats: as a lacrosse captain, soccer player, DECA president, and Roberts Rowdies co-founder. Binder enjoys everything he’s done and has done at Webster, but lacrosse is his first love overall. Over his four years he is the All-time goal scorer at Webster with 167 points with nine games left in the regular season. “Lacrosse has been my favorite sport since the sixth grade,” Binder said. Over 10 lacrosse schools from Division 1-Division 3 have contacted Binder to play at the next level including Boston University, Ohio Weslyan, Rockhurst and top 25 ranked Albany, but none of them were the right fit for him. Binder’s sophomore and junior year he was named All-Conference and All-Metro and last season named to the All-State team. A highlight he’s had over his four years was winning State his junior and senior year. Binder was a part of a team that brought the first State championship ever to Webster. As DECA President Binder was able to partner with the Make a Wish Foundation for a child named Carter, whom DECA sent with his family to Disney World and have raised over $6,000. “It was a great feeling to help out a family. When Mrs. Karen Seibe asked who wanted to spearhead this project, without a doubt I said, myself,” Binder said. Binder isn’t sure what college he wants to attend yet. It’s between Mizzou, Michigan State, Indiana and Miami of Ohio. He plans to study business marketing and wants to be in a position to help others after college.